May all your projects, from beginning to end, have a bag to call home! 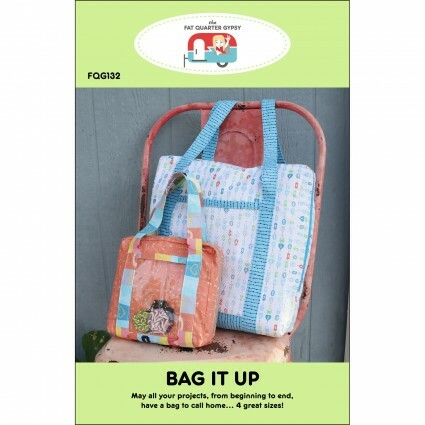 Pattern makes bags in four versatile sizes! From handwork to mid-project organizing to the trip to the longarmer, there's a perfect size (or two or three!) for you! Uses double-slider handbag zippers (not included). Front pocket can be made from lightweight mesh, plastic, or fabric. Includes one "Fat Quarter Gypsy" logo label. Medium: 12" x 12" x 3-1/2"
Large: 15" x 15" x 4-1/2"
Jumbo: 18" x 18" x 6"